Connie Hart, Jeanie Ortegon and Joy Ivy. fat quarter bundle, and queen size Warm and Natural batting. Debby Kratovil also donated her book "Super Size Em". In addition Debby donated her Quilter's Block-a-Day Calendar, a fat quarter bundle, and a set of one yard bundles to each of the eight participants. Vickie Mazurek shows one of her collage quilts, "Black Hills Bison". Each flower is individually cut out, fused down and closely quilted. 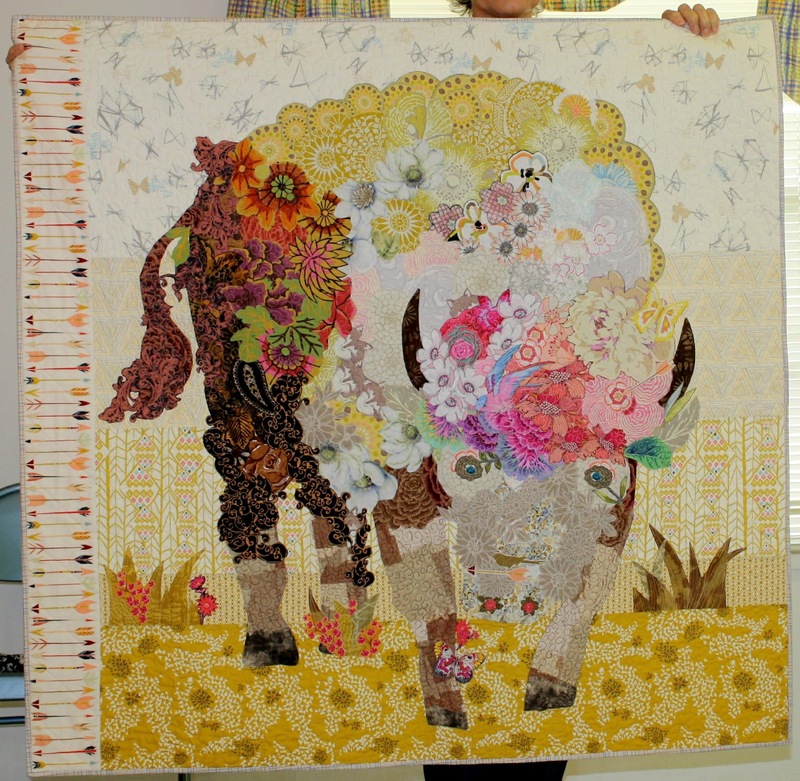 Millie Schwab made a cute quilt she calls Confetti Baby. Connie Hart shows the original picture of Bess that she turned into an art quilt. Doniene Fullagar shows a quilt she quilted, which was pieced by her daughter Mandie. Another quilt quilted by Doniene, pieced by her daughter Mandie. Up close of the pretty quilting Doniene does on her home machine. Doniene made a "Friendship Star" quilt for a friend who moved away. Wanda Jackson, Vickie Mazurek and Ruby Goodwin. Block of the Month winner is Shelia Smith. Monthly Drawing winners are Stella Burns, Mildred Turner, Lana Webb and Judy Tiedaman. Fat Quarter winner this month is Joy Ivy. 2 years of dedicated service. A new board takes office in June.